There are lots of types and causes of distraction and while I love the examples Orlick includes, I find that I actually categorize my distractions and work to alleviate them slightly differently. 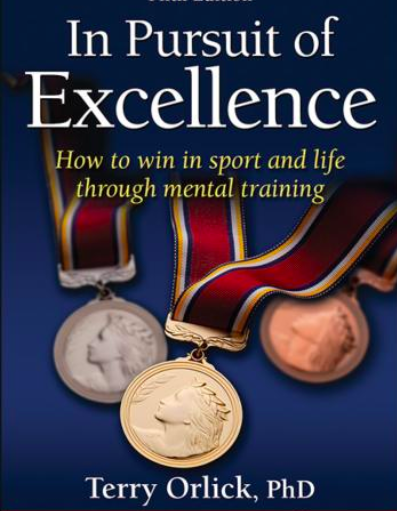 On the one hand, distractions are all the same in that they take away, “the focus that allows you to execute your skills effectively” (p. 87). What they all have in common is needing to be practiced (just like any other skill on your instrument needs to be practiced). But I think clarifying different ways we are distracted can be helpful. Outcome focused–when you think about the score: winning the audition, getting praise for playing well, etc. These are bad because simply if you are thinking about this, you cannot be thinking about conveying your musical idea. Evaluation focused–as Bulletproof Musician explains beautifully, we have two playing modes: practice and performance. In practice mode, our mind is balancing executing skills with analyzing how to fix them. In performance mode, our mind should only be executing skills. Even if we aren’t worried about winning or how others perceive us, we are used to self-critiquing as we play. As this blog explains, we need the skill of controlling which mental state we want to be in–a skill which, like every other skill, takes practice. The most basic and obvious direction is to give yourself practice performances where you record yourself and attempt to not self-evaluate while playing. Afterward, you can go to your recording and base your next practice on that performance. But practicing being in a mental state that is totally unconcerned with the past is vital for controlling these types of distractions. Mistake–Sometimes playing something wrong is a terrifying surprise. None of us are above mistakes–intonation problems, less than perfect rhythm, a not so smooth interval, flubbed articulation, even a missed note. Sometimes making a mistake sends us into self-evaluation mode as above. Sometimes just the fact that it happened is surprising and messes with our focus by making us worried (rather than analyzing how to fix it) or just generally breaking our focus. As Orlick explains, we can practice refocusing. He gave the example of taking the experience of your last mistake and imagining recovering quickly. I think it is more important to consider these in practice “performances” or in rehearsal settings rather than typical learning-centered practice sessions. Mistakes in practice settings are (more often) because we are still learning to execute a skill. Mistakes in performance mode are (often) because of a break in focus (while executing that skill). As a secondary tactic, make sure you have a good foundation of a mental concept of each phrase. Mentally rehearse each phrase so that you can access your mental representation of the music on demand at any time–even in the pressured situation of recovering from a mistake. That is, I mentally go through visualizations or imaginations of the piece as a whole and in small chunks so that I have practice calling those musical and technical ideas into focus on demand.